“No, it’s not the economy, stupid. It’s interest rates, stupid. Their course and trajectory have had a profound influence over time on our markets. Precisely when that rate influence ‘bears’ on our markets is always hard to ascertain. 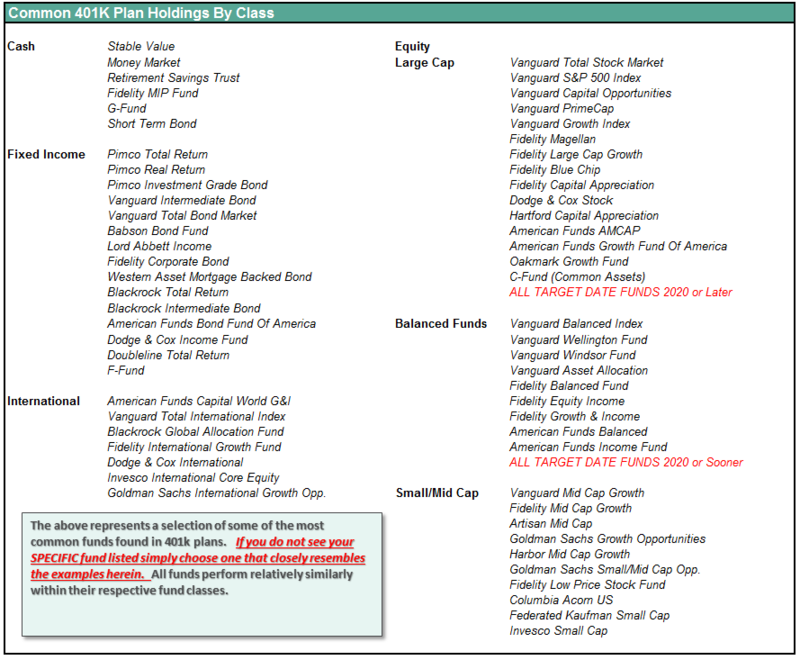 Perhaps with the benefit of hindsight, we over thought what factors ultimately would debilitate the capital markets. Perhaps concerns over possible policy issues and or policy mistakes, never-ending political surprises, continued sovereign debt crises, and other issues were simply decoys. Perhaps it was in front of us all the time, just as it has been in almost every meaningful markdown in history. In the U.S. we have dismissed higher rates because of a seemingly strong economy. “Global bond yields are on the rise again, led by the US Treasury yields, which as we have highlighted in numerous reports, is the world’s risk-free rate. The JPM Global Bond yield, after being in a tight channel, has now begun to accelerate higher. There is scope for the JPM Global Bond yield to rise another 20-30bps, close to 2.70%, which is the ‘Rubicon level’ for global financial markets, in our view. “Major liquidity crunches often occur when yield curves around the world flatten or invert. Currently, the global yield curve is inverted; this is an ominous sign for the global economy and financial markets, especially overvalued stocks markets like the US. And if they are right, this is going to leave the Federal Reserve in a tough position of having tightened monetary policy to much. With bond traders more short than at any point in history, the ultimate “reversion to the mean” in Treasury’s will drive rates towards zero. 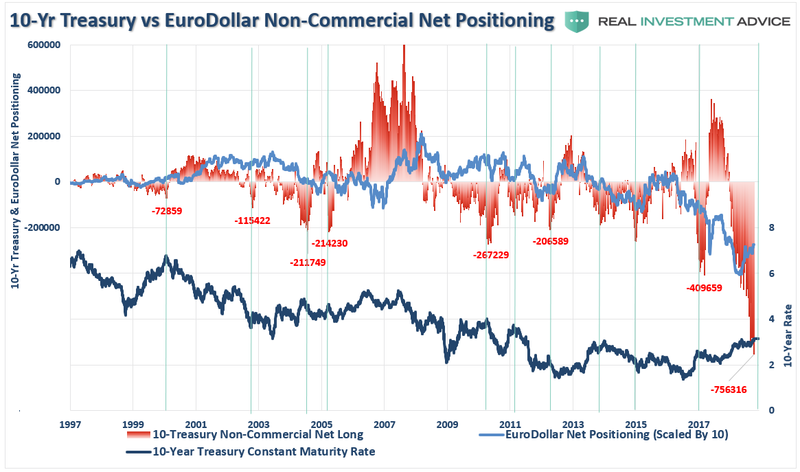 The chart below strips out all periods EXCEPT where net-short bond positions exceeded 100,000 contracts. In every case, interest rates turned lower. The recent blow out in risk parity, as noted by a surge in volatility, is evidence that something likely just broke. History bears this out as well. 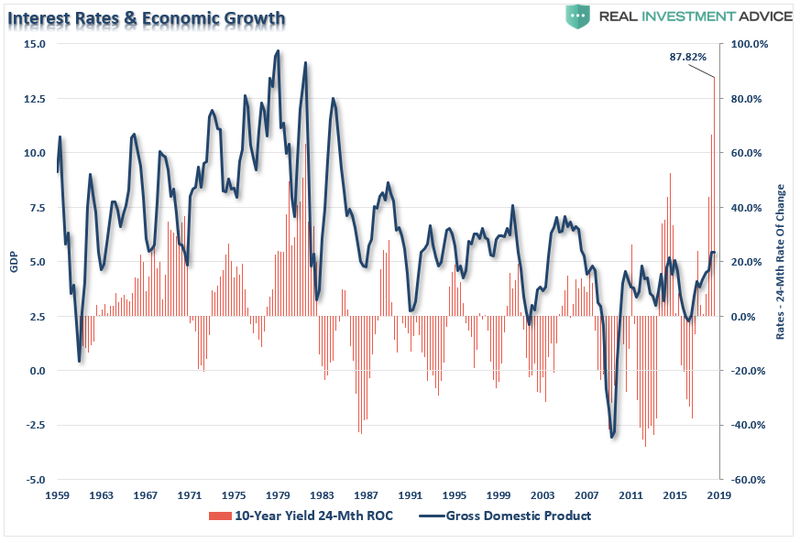 Whenever the 10-year yield has traded at, or above, 2-standard deviations above the 2-year moving average, bad things have tended to occur from recessions, to corrections, to outright crisis. Given the 2-year rate of change on the 10-year has surged to the highest level in over 50-years – if something hasn’t already broken, it likely will soon. The table below looks at the rate of change from the preceding low to the subsequent peak and the outcome of rising rates. Again, there has NEVER been a period where both rates and stocks rose simultaneously. Also, as shown above, the current percentage change in rates is the highest since 1957. More importantly, rising rates are NOT JUST a consideration of stocks versus bonds. If the stock market falls, the top-20% of the economy gets a little depressed because their wealth declines a bit. 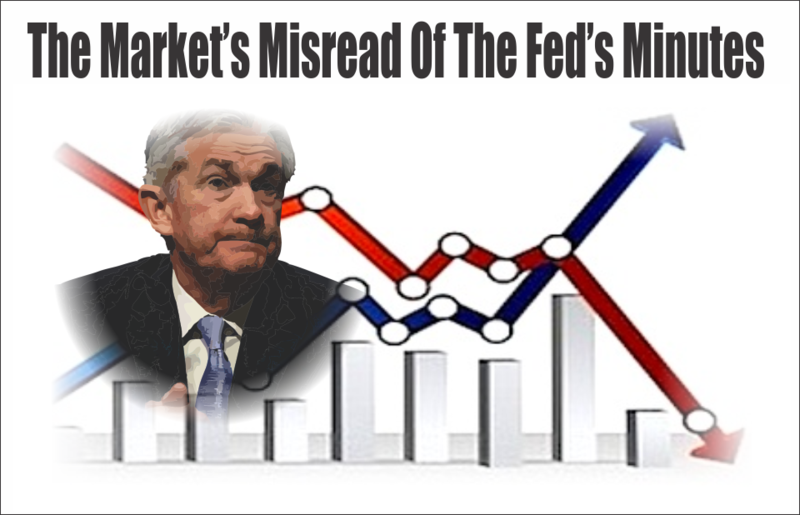 However, given the bottom 80% have very little invested in the financial markets, when RATES surge higher, it is 100% of the economy that feels the pinch. As Doug notes, interest rates run through the entirety of the financial and economic backdrop. Debt is often issued by corporations in order to buy back stock and pay dividends. Advancing rates reduce a company’s return on investment on those buybacks. The deficit/GDP ratio will increase as interest rates rise and the consensus expectation for lower future deficits will crumble. There is now an alternative to stocks as the yield on the one-month bill (2.16%) and the two-year Treasury note (2.89%) compare favorably to the S&P 500’s dividend yield of only 1.77%. Further rises in interest rates will serve as an even more competitive and attractive alternative to stocks. Rising interest rates in the U.S. will buoy the dollar, exacerbating the ability of weaker countries and corporations to service their dollar-denominated debt. The issue of rising interest rates may have finally woken overly complacent investors from their bullish slumber. We won’t know until we get a rally that fails to set a new high. But one thing is for sure…if something hasn’t already broken, it will break soon if rates keep rising. That day may be much sooner than most expect. As noted above, we have tightened up stops considerably and next week will begin to start rebalancing and hedging risks accordingly. Industrials, Energy, Utilities, and Financials we the stronger performers last week as money rotated out of more consumer-oriented sectors which will likely be impacted by higher interest rates. While the sectors remain short-term bullish, money is rotating very rapidly through the market currently so some caution is advised. Discretionary, Staples, and Materials violated their 50-dma last week. Materials remain in a bearish trend currently. With discretionary and staples getting oversold, look for a bounce next week to rebalance risks into. Real Estate because of the rise of interest rates has been under pressure as of late. Look for support at the 200-dma. If rates fall back below 3% in the next week or two, there should be a very tradeable opportunity for REIT’s in the short-term given the very oversold condition. The recent recommendation to take profits was timely. Energy – The uptick in oil prices over the last couple of weeks brought money flows back into the Energy sector which has rallied and is currently flirting with a “double top.” Stops should remain at the 200-dma. 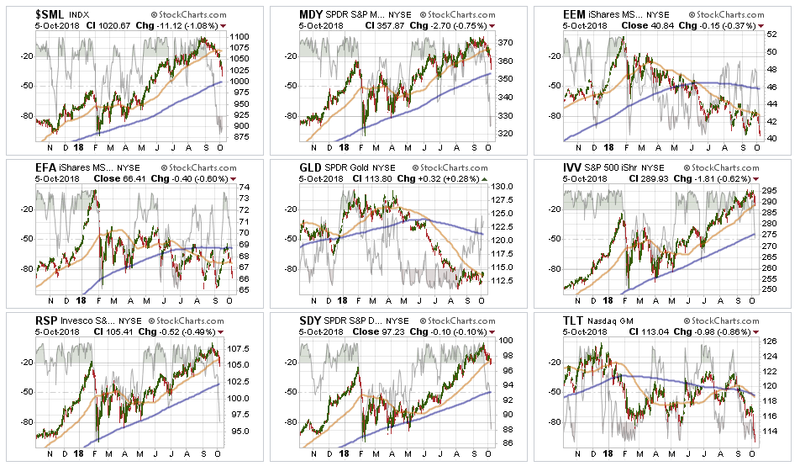 Financials continue to languish. The only good news here currently is that after falling apart previously, the past weeks the sector rallied but failed at the 50-dma. 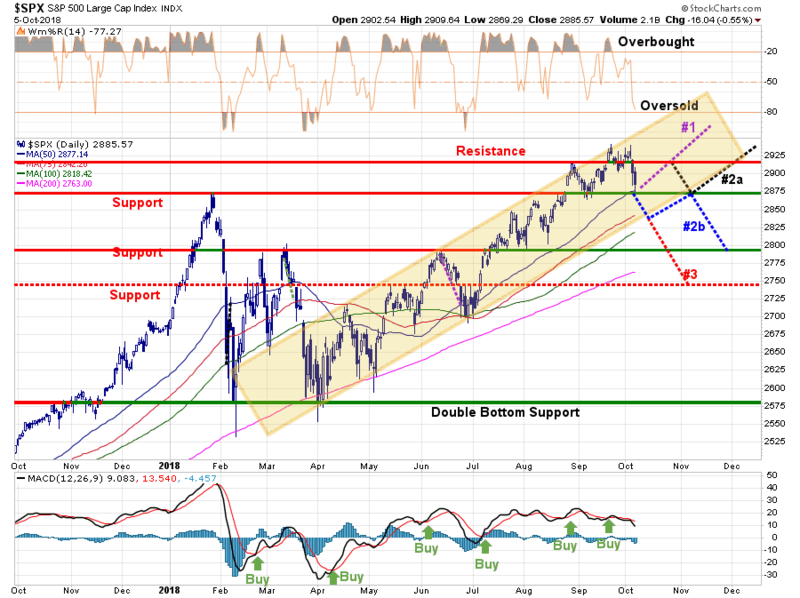 Move stops up to the recent lows, and watch the 200-dma as important support. 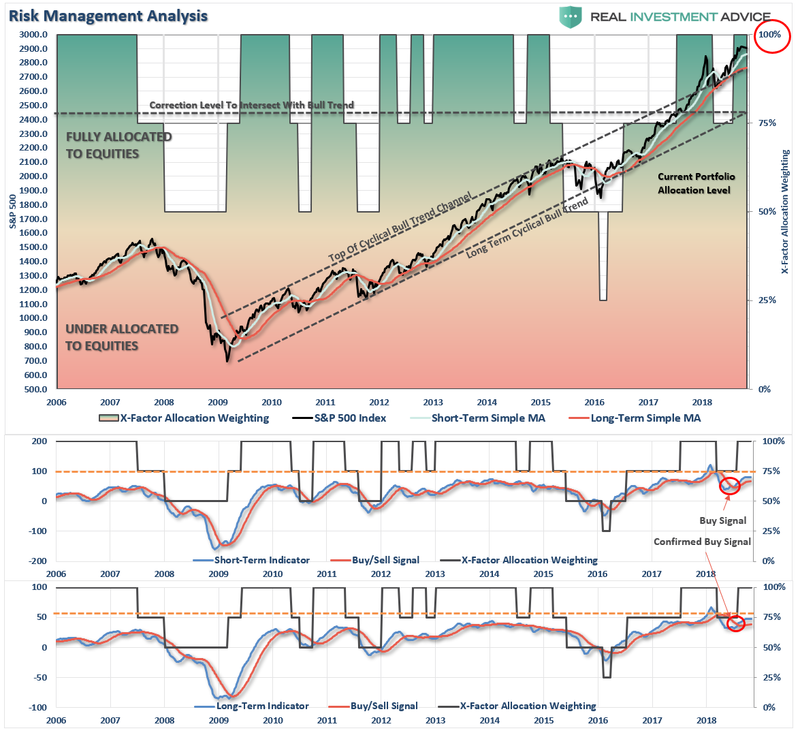 Small-Cap and Mid Cap – we noted five weeks ago that these markets were extremely overbought and extended, and a pullback to support was needed. The advice to take profits in these sectors was prescient with both sectors violating their respective 50-dma’s in the recent sell-off. Mid and Small-caps are now very oversold so look for a failed rally back to the 50-dma’s to reduce risk in portfolios. As noted, several weeks ago, with the market holding support above the “breakout” levels from January, we added exposure to portfolios. With the pullback to that breakout level this past week we will wait to see if these levels hold. 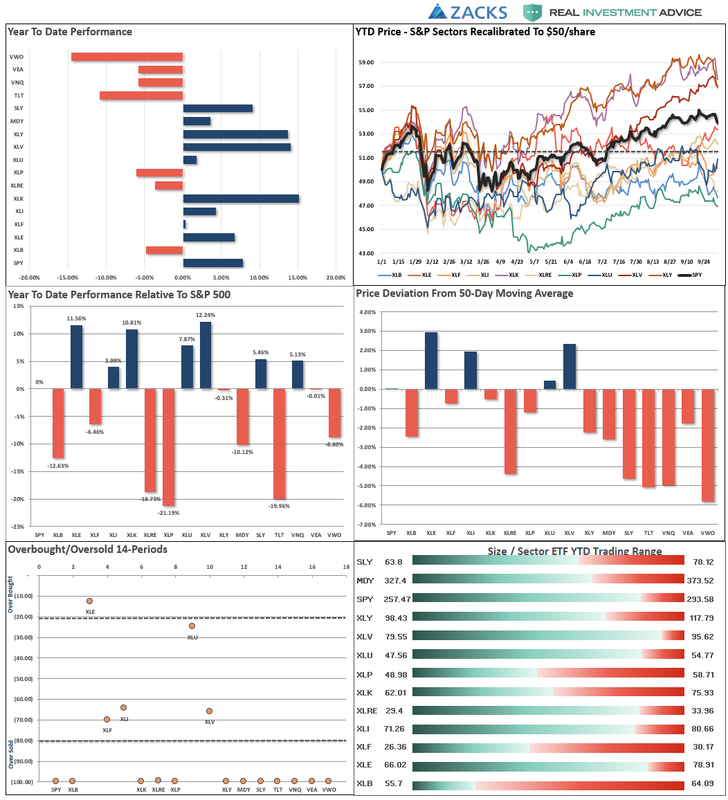 The bad news is that the rotation between sectors and markets has deteriorated in recent days, so we are becoming a bit more cautious in the short-term. However, our view that we will likely see and end-of-year push still remains intact. For now. New clients: We are watching the current pullback to hold support to on-board new positions. Equity Model: Semiconductors (MU & KLAC) remain on “Sell Alerts” – we are monitoring these positions closely and stop-loss levels have been tightened up. If the market sells off more this coming week we will likely get stopped out of several positions which will raise our cash levels and hedge portfolio risk. ETF Model: We overweighted the core “domestic” indices by adding a pure S&P 500 index ETF to offset lack of international exposure. We remain overweight outperforming sectors to offset underweights in under-performing sectors. We will likely reduce small and mid-cap holdings on a rally to the 50-dma. Option-Wrapped Equity Model – If the market rallies, and fails to obtain a new high, we will add a long-date S&P 5oo put option to portfolios to hedge risk. Well, we got a correction working off some of that over-extension and overbought condition. However, with rates above 3%, there could be more angst as we move into next week. Also, given the deterioration in the breadth of performance, risk has risen in the short-term. However, with that being said, NOTHING has happened currently that would warrant reducing equity risk currently. Use ANY rally next week to make sure your 401k plans are balanced. Use the following guidelines for now. If you are underweight equities – Use this pullback to step towards your allocation target. (1/3 of total increase needed.) As noted last week, the expected pullback provides a better risk/reward opportunity to increase exposure towards domestic equity to levels where you feel comfortable. There is no need to go “all in” at one time. Step in on any weakness.